From left, Amber Meserve, Cole Meserve and Christopher Michaud are facing numerous burglary and theft charges. 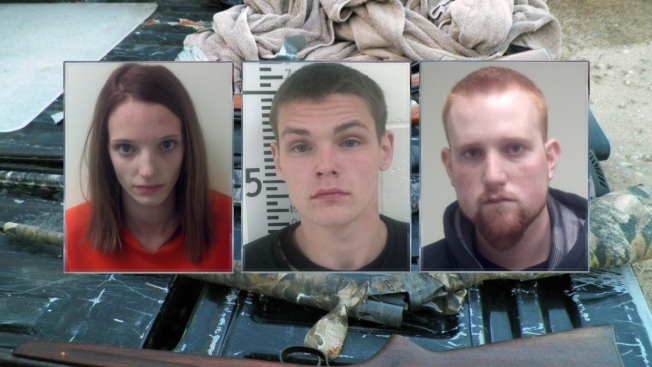 Police in Maine announced Monday that they have arrested three people in connection with a string of more than 20 burglaries in York, Cumberland and Oxford counties over the past two months. Christopher Michaud, 23, of Limerick and siblings Cole Meserve, 20, of Standish and Amber Meserve, 21, of Limerick were arrested on numerous burglary and theft charges. They are being held on $1,000 bail at York County Jail pending arraignment Monday in Springvale District Court. State and local police and the York County Sheriff's Office had been investigating daytime residential burglaries in Sebago, Brownfield, Denmark, Gorham, Limington, Limerick, Dayton and Lyman since October. Entry to the homes was made by kicking in doors. Stolen were over 20 guns, electronics, jewelry, cash, racing dirt bikes and marijuana. The money generated by the stolen items was reportedly used to buy drugs. Search warrants were issued last week, and two houses in Limerick and Buxton were searched Friday and early Saturday morning. Also searched was a self-storage locker facility in Limerick. Investigators recovered several guns, three dirt bikes, televisions, computers and other electronic devices. Also seized was a large amount of marijuana. Police said it is believed that Amber Meserve had her two small children in her vehicle during some of the burglaries. They said a second woman is expected to be charged shortly after investigators located a large amount of heroin during one of the searches. Several stolen firearms have yet to be located, and state police are asking anyone with information to call Trooper Jeremy Forbes at 207-657-3030.